I buy veggies. That’s not the problem. The problem is that we don’t always manage to eat them quickly enough and they get soft or moldy or otherwise inedible. For example: do onions make good houseplants? This one has great aspirations! I’m trying really hard to get better at this because I hate wasting food. So far, I’m roasting peppers that are too soft for decent salads, and using floppy broccoli, carrots, and celery in soups (broccoli gets its own soup, and the others assist in chicken soup). If I can’t do it right away, I try to freeze them before they’re past the point of inedibility. When my mushrooms start looking a little sad, I fry them up in butter and eat them that way. But what about onions that are starting to sprout? Or potatoes that are mostly eyes and brown spots? Bagged spinach that’s started to wilt? Tomatoes that are too squishy to slice even with the most incredible of infomercial knives? Does anyone have any ideas for using up almost-unusable veggies? I don’t usually have this problem with fruit, except for strawberries, which refuse to last more than a day or two in the fridge, but I’ll gladly take pointers on rescuing fruit from the brink, as well! This entry was posted in Uncategorized on March 31, 2011 by antijen. 1) Onions: Well, I just cut out the greenery and use the rest of the onion. It’s fine. 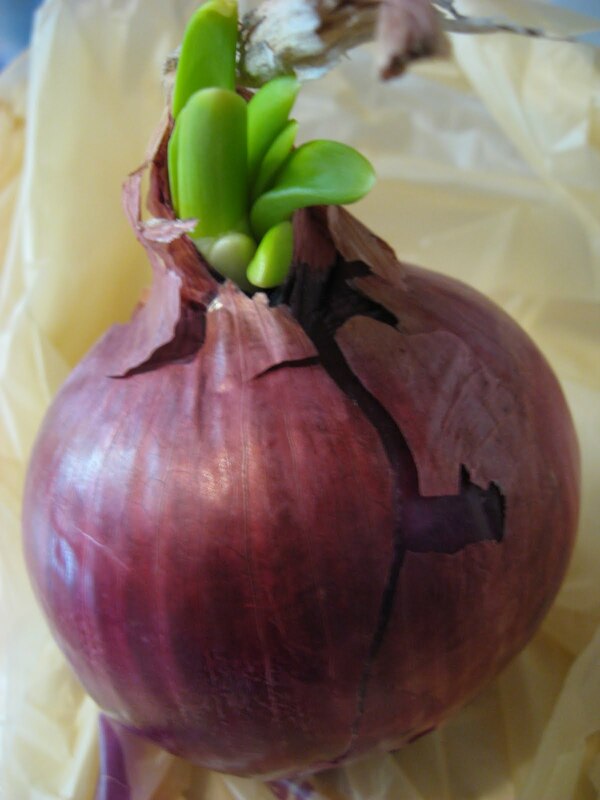 In fact, farmers at our year-round farmers market sell onions that are sprouting, so I’m pretty sure it’s really fine. I haven’t had an issue yet. And, I imagine the greens are edible for soups & stocks & such, though I don’t know. 2) Potatoes: I pop off anything that’s sprouting with my fingers (since the only edible part of the potato is the tuber), then I give ’em a squeeze. If they’re only mildly squishy, I use them for mashed potatoes or other sorts of soft things. If they’re a lot squishy, into the freezer stock bucket they go. Some folks don’t like potato in their chicken or veggie stock, but I am fine with it. 3) Spinach: I never manage to rescue mine. However, my friend Jessica says to just throw it in the freezer if it looks like you won’t get to it before it goes off, then treat like supermarket frozen spinach. Vicki Nowicki of libertygardens.com said something similar in the “Yes, We Can!” workshop at the Family Farmed Expo here in Chicago. 4) Tomatoes: If you can peel ’em, you can make a decent tomato sauce with them. Or you can can them. Or you can throw them in the freezer (peeled or not, I’m told) for later use in things. 5) Fruit: Just about anything can be made into a jam, and I’m sure Corrine would love to show you how to do it (she’s good for a lot of this info, really). Apples can also become pies and sauces. Hell, slightly squishy apples can be made into meals with pork or chicken easily. Berries that you don’t want to eat straight but aren’t bad yet make awesome smoothies, and I think you end up with more of them in your belly that way. If peaches go bad, you should be ashamed of yourself.